FLUELLEN …and I do believe your majesty takes no scorn to wear the leek upon Saint Tavy’s day. KING HENRY V I wear it for a memorable honour; For I am Welsh, you know, good countryman. Break out the daffodils and leeks! This past Friday, March 1, was St. David’s Day, the feast day of the patron saint of Wales and a national holiday in that country. As long as you are cleaning and slicing leeks, let’s take a quick close look at the vegetable, one of the national symbols of Wales. Leeks, along with onions and garlic, are in the genus Allium in the family Amaryllidaceae. Like many other monocots, they have long slender leaves striped with parallel veins. Also common in monocots, and sometimes confusing, is the way their leaves develop. 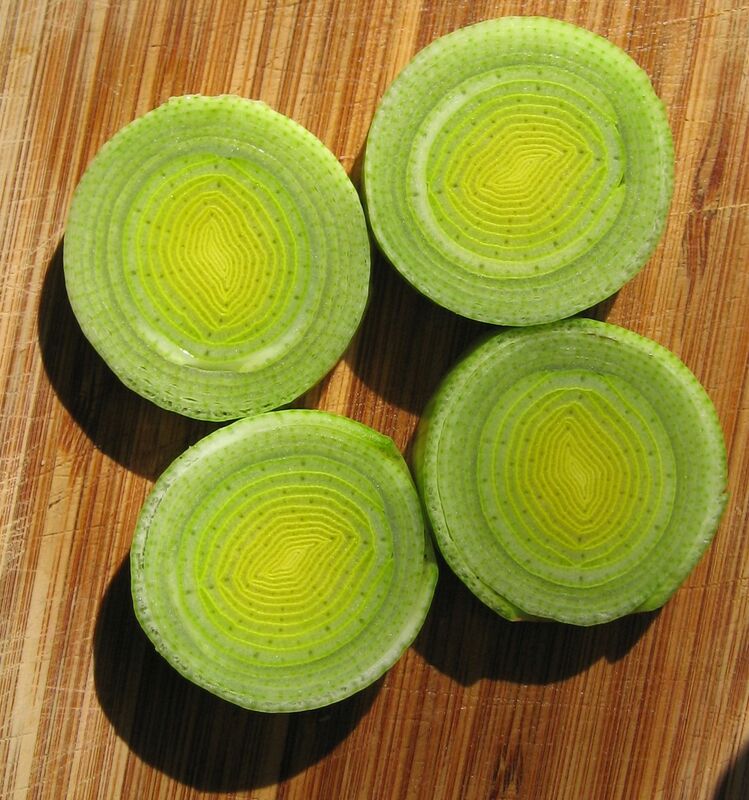 The white part of a leek looks like a big solid cylinder composed of concentric leaf tubes, and essentially it is. Each new leaf develops at the center of the cylinder in the form of a tube that surrounds the next little mound of tissue that will develop into a leaf. This is easy to see if you slice the root end of the leek in half as close to the center as possible and examine the innermost leaves. In mature leaves, the top part of the tube opens up into a flat green blade. Contracted contractile roots. Click to enlarge for more detail. The pattern of leaves enclosing leaves at the base is evident in many monocot houseplants, such as peace lilies and orchids. 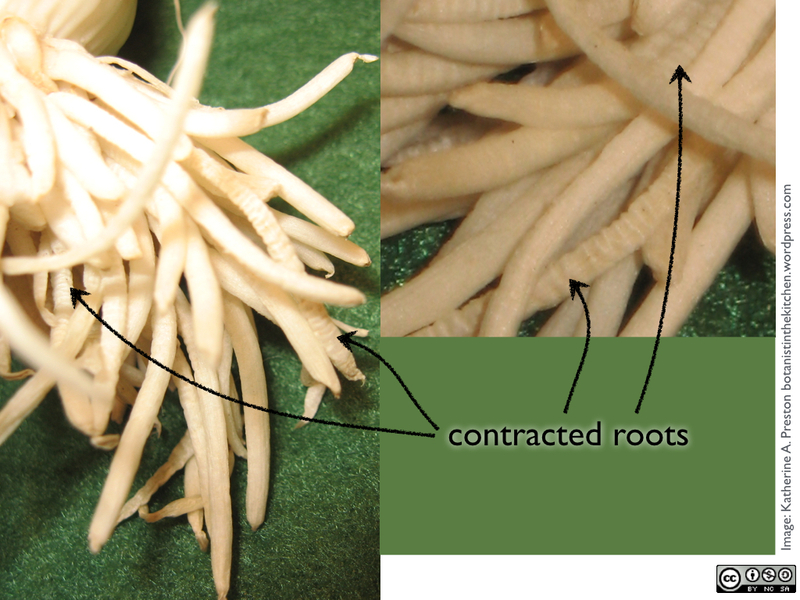 It is also easy to see in corn plants as well as onions and garlic. If you have any leftover leeks, please save them for our post on potato leek soup. This entry was posted in Uncategorized and tagged Katherine Preston, morphology, vegetables. Bookmark the permalink. Ay leeks ARE good as is your column. Look forward to each one. Thanks! Check out how a banana “tree’s” “stem” is constructed; a 2.5-3 m tube of concentrically overlapping leaf bases.